The new 16" ''Tabletop'' Battery Operated Chocolate Fountain is an entirely new concept in chocolate fountains. The battery fountain runs on just one lb., but holds up to two lbs. This makes it perfect for a romantic dessert for two or a centerpiece for 8-10 guests. 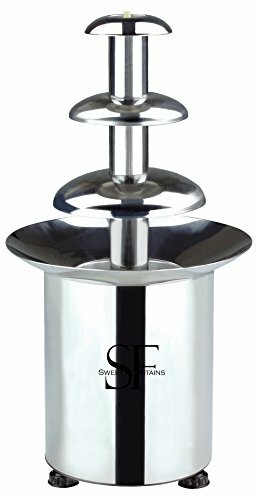 The Battery Operated Chocolate Fountain is made from polished stainless steel and it includes a removable, rechargeable lithium ion battery for repeated use. Can also be ran while plugged in for unlimited time (plug/charger included with purchase). If you have any questions about this product by Sagra, contact us by completing and submitting the form below. If you are looking for a specif part number, please include it with your message.